It gracefully handles all the requirements For Easy School Management. 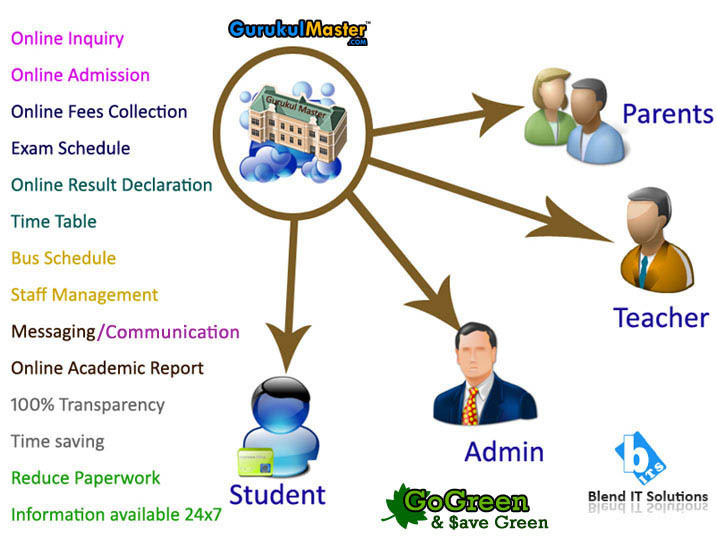 eGurukulMaster (Online School Management System)comprises of various sub modules to facilitate all the departments’ proceedings and functions. It centralizes the mountains of data to learning and automates routing administrative functions. This package has education's most flexible and interactive scheduling function, thus meeting the communication and information needs of schools. Technology is assisting every business to grow, so why not the educational industry. Keeping the requirements in mind, we have developed software exclusively for managing the administration and working of schools. This system provides separate login ids to students, faculty, staff, management, parents and alumni. This helps in bridging the communication gap among all the concerned people. It is very helpful for the parents to keep a constant check on their children’s performance at any point of time. Even if they are out of town, they can access the system online. The parents of students are very busy now days, this school management system helps the parents monitor their children from anywhere. They can check their children's academic performance from a remote location. They can also deposit the school fees, bus fees etc., using online secured payment integrated with this application Using this school management system the users can see the student’s class attendance in various formats, day-wise, monthly attendance, session or total attendance. Marks or report card can be viewed or added. Assignments & homework’s can be viewed or posted using this application. Online leave applications can also be filed by students which gets viewed when the teachers take the daily attendance Books, apparels & other essential items can be bought online using the online shopping cart included with the school management system (online purchasing available in provision). The GurukulMaster from the traditional school through the physical media that links administrators, teachers, and students.